We have the wonderful good fortune of being connected to amazingly creative people in awesome jobs! Andrea DeMaio is the sister of Kate's sister-in-law, Karen. Besides being a sweet, positive, and generous friend and a talented baker, she is now the marketing director for Maman, a small chain of French-inspired cafes in New York City and a few other locations. Since Karen is familiar with our work and has done freelance design for Maman (check out their gorgeous menus! ), she suggested we approach them to design a winter window display featuring our knits. When we looked at their images and style, we were inspired by their blue palette and floral and snowflake motifs, all based on French countryside toile prints. Their cafes are warm and inviting and we were excited to add our own cozy knit artwork to complement their atmosphere. Karen illustrates beautiful floral designs, and we've always thought it would be fun to translate her drawings into knit work. She drew some floral and bunny shapes that we used for color work panels in the Soho window. We were providing window displays for their 3 major cafes in NY, one in Soho, Greenpoint, and Tribeca. We wanted each to have their own defined style but still work together overall. 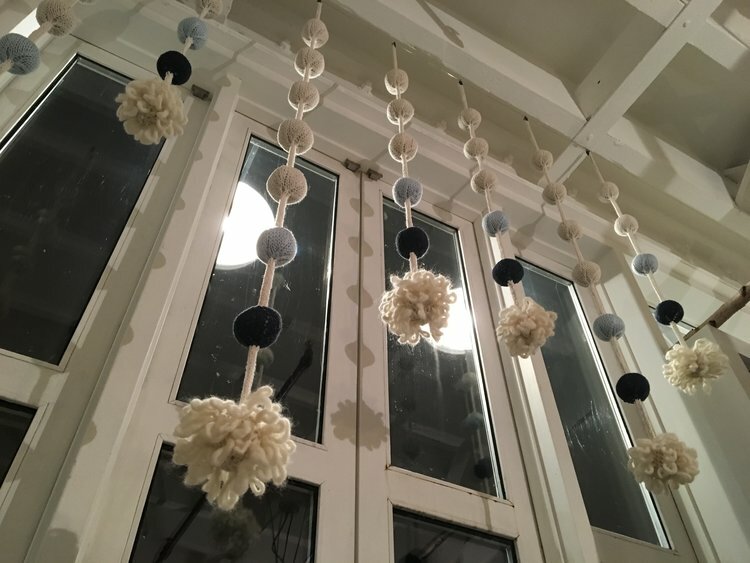 We used our trademark bobbles as garlands and vertical hangings, and experimented with a new open sphere design. It was so much fun to drive up to the city, install the windows, sip coffee, and laugh all day with Karen and Andrea. We met Elisa and Ben at the Tribeca location, and were blown away by their hospitality. They were so generous, enthusiastic, and friendly! It was obvious that their spirit imbued each cafe with a delightful uniqueness and charm, shown in their creative decor, family photos of happy children, and more bunnies than we could count! We are honored that we could use our passion of knitting to contribute to the beautiful mood of Maman. The Soho display incorporated our trademark cream bobble garlands, and some fun smaller items that we think captures the essence of everything Maman. We love bunnies, coffee, and bobbles! We invented these open sphere hangings for a graphic look at the Tribeca location. These hanging bobbles create more of an interior cozy feel at the Greenpoint Maman.